Every time I see a big positive TV ad for Terry Branstad, my first thought is – “What is it that we are not being told?” While he brags on employment under his administration, most observers understand that Iowa has lagged the national average and is well behind where they should be. What else is under the surface can be gleened from a report from the non-partisan Iowa Policy Project. * Child poverty was 15.7 percent in 2013 (about 111,119 children), up from 13.1 percent in 2007 and 12 percent in 2001. * Median income was $52,229 in 2013, changing little from the 2001 inflation-adjusted dollars, but dropping from $53,132 in 2007. 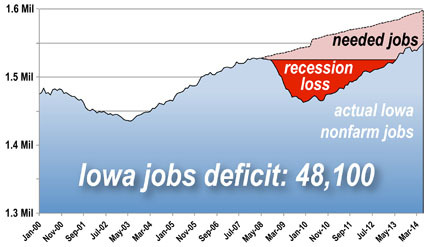 I thank Iowa Policy Project for their research which takes the hype out of the story and reports the facts. Members of the legislature would be well served to check into this research at least once a week to get a true look at what is going on. This entry was posted in Economy, Food Insecurity, Iowa Policy Project, Jobs, poverty and tagged Branstad. Bookmark the permalink.